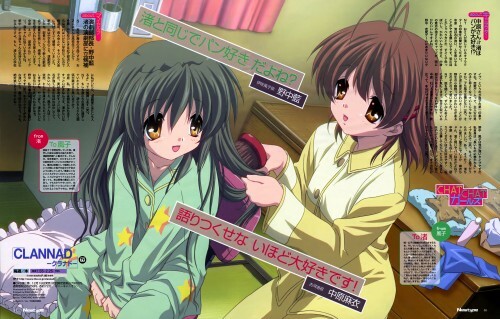 Ths image just popped up on an imageboard and I thought I'd share it while I was posting Clannad scans. I don't usually submit scans...I have more, maybe I should post them? Wow! Thats huge! Nice scan. I'm so glad to see a scan with these two! Fuuko is my favorite. Final Hitode Tsukai! Fuuko! Hehehe! Fuuko has a funny *weird* personality that fits her well! Nagisa is cute in her own right! She really fits to be Tomoya's future wife... which seems to be the case since I've seen Ushio *spoiler* - their daughter - running in the opening of the anime. Hehehe! Sorry for that if you didn't want to know. waaaaa fuko and nagisa! great pic! Such a cute scan :D I sooo want to make a wall with this. she was born knowing how to be a housewife and a mother. Thanks for sharing. Very cute.